In a food processor, blend the ground beef with the garlic, salt, 4 spices, cinnamon, and egg. Blend everything together until very smooth. Roll the mixture in a cylindrical form. Stuff it with pistachios, and toss it in some flour. In a skillet over medium-high heat, add oil. Sauté the meat roll on both sides until golden brown. In a pot, add 1 liter of water, bring it to a boil then add the vinegar. Drop the meat roll in the pot and simmer for around 1 hour. Remove it and let it cool in a plate. 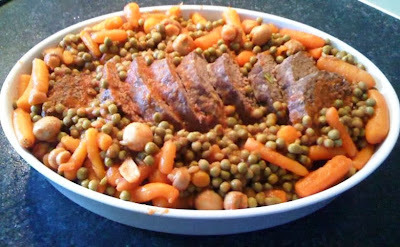 Serve the meat in slices with peas and carrots cooked in tomato sauce.